I consider myself culturally Catholic: baptized, never confirmed, but raised by a Catholic mother who left the church when she and my father divorced. In short: not Catholic at all. It always felt as if my mother tried to find the right spiritual fit for us, church-hopping until she found the Episcopalians: They’re like the Catholics, but without all the rigmarole. But in the toughest times of her life, she’d still seek guidance from a priest, or blessings from nuns. I found tiny holy water bottles tucked in dresser drawers when she died. Saint Theresa prayer cards fluttered from books, rosaries tangled in boxes. Recently Jeff and I were talking with a neighbor who asked why I had so many saint statues. It’s difficult to explain unless you grew up here in Pittsburgh, where the Virgin Mary is just part of the decor; you plant a garden, and then you gotta get a Mary for the living room window too. Its kitschy, it’s comforting. It’s a mysterious part of who I am, a world in which I was initiated at birth, but never fully integrated. 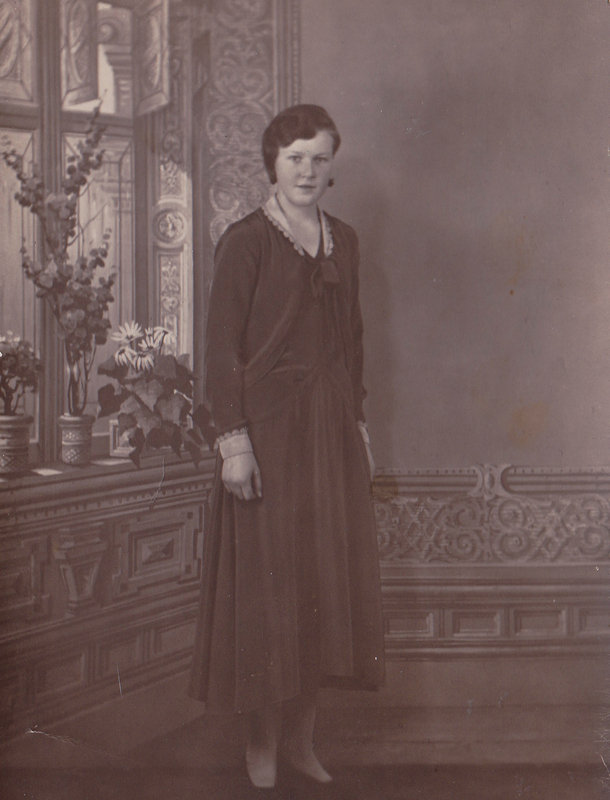 On the back: Astri Larsen, Confirmation 1930 – second day dress. 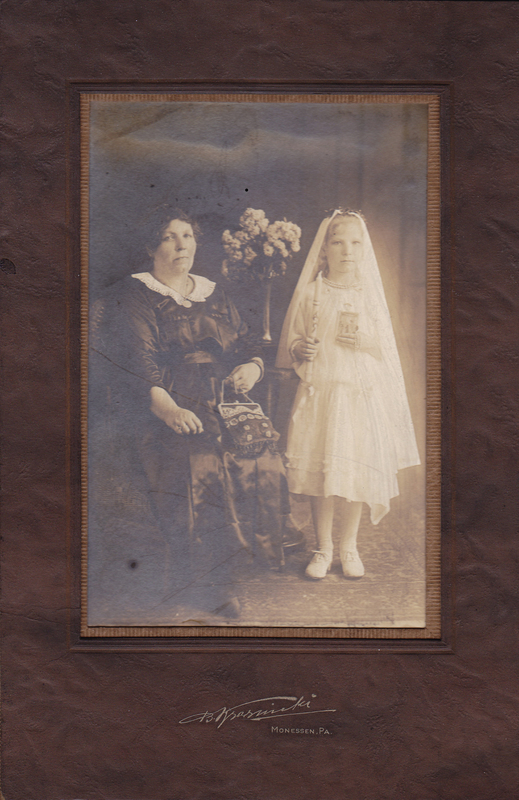 some girls get flowers – jeff gives me haunting old photos. When I saw that last photo, I knew it was something you had to own. Well they are haunting photos to say the least. Very ornate settings too, luminous. I understand the ubiquity of Mary statues: they are comforting in an odd way (certainly different from the Christ on the cross statues which go from somnamulent to violently cruel. Thanks for sharing–gave me a bit of a jolt! “Very ornate settings too, luminous.” – such a great way to explain how I saw these too. 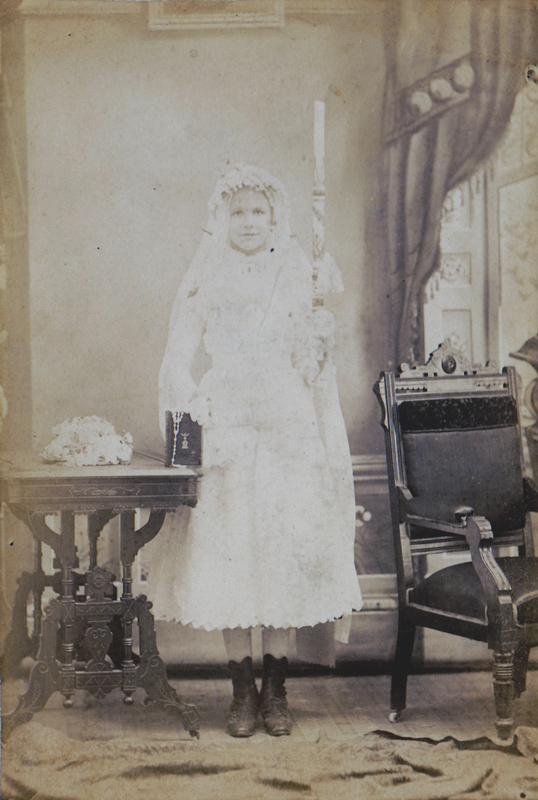 There is something confident, haunting in the girls’ expressions (I have yet to find a male communion photo in my searches, strangely enough). Thanks for your insight, as always (and sorry for the “jolt” :). Great photos. The last one with the two eerily similar faces and expressions is a “to die for” collectable! I was brought up Catholic, too but have lapsed to the point I classify myself as an athiest, however I love religious kitsch and have a substantial collection of my grandmother’s holy cards, prayer books (some with the most amazingly ornate covers) and crucifixes. There are one or 2 statues about but not on display. Thanks, Katherine – that last photo too was such a great gift from Jeff (he knows me well!). The first one also captured me when I first saw it. 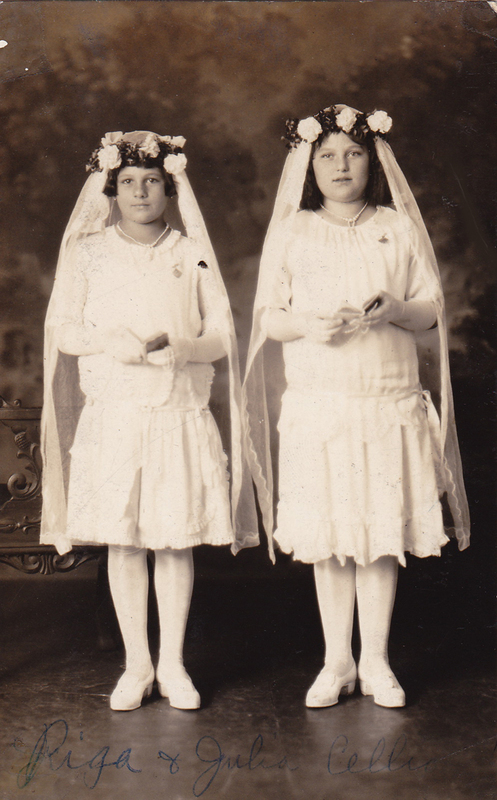 I thought at first the two girls were twins – but wouldn’t they be around the same age to receive communion (7 or 8?). I think people who grow up in Catholic families understand the hold it has on a person, even if they are no longer practicing. These pictures are haunting and beautiful. I feel like I know all about you from the way you write. I also love the Pittsburgh Catholic kitsch. We rented our first house here and kept finding saints cards all around the house. Weird I’m not Catholic at all. But it was oddly comforting. Hi Naima – That is so wonderful that you found saint cards around your house. It’s such a part of my childhood growing up here that I can’t imagine *not* having them around (my husband thinks it’s interesting, and maybe a little odd :)). Thanks for your lovely comment too, about the way I write – it makes me happy that I am getting across a ‘voice’ in my writing of this blog. I love your journalistic style of writing with this entry. Journalistic Journaling. “Interviewing” neighbors, like a foreign correspondent in a world your were “initiated at birth, but never fully integrated.” This feels like the beginnings of a greater story. Great work. Thanks, lady – when I wrote this, I wasn’t sure how to tackle the ‘religous’ part of me (if you wish to call it that). Catholicism is just one group of which I never felt a part, for various reasons – one being that because of my parents divorce, I was automatically ‘banned’ before I could make a choice. A precarious balance in the worlds in which I live.